Scurvy grass is a biennial or perennial plant; the main root has many fibrous branch-roots and produces angular, furrowed stems as well as fleshy basal leaves. The basal leaves are oblong, reniform, or cordate; the scattered stem leaves are obovate to oblong and sessile or nearly so. Small which flowers grow in racemes from April to August. The fruit is a small, almost globose pod containing small, reddish-brown seeds. Found wild in moist places in northern Europe and the northern parts of North America and Asia; also found cultivated. 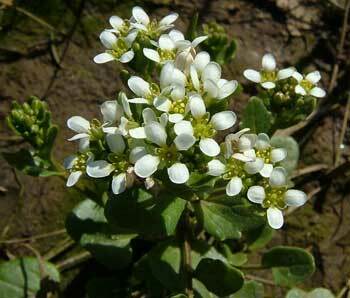 As a source of vitamin C, scurvy grass has been used in the past to prevent and treat scurvy. Considered a good blood purifier and has been recommended for rheumatism, dropsy, and venereal diseases. The juice can be added to orange juice to make a healthful spring tonic. Scurvy grass must be used fresh.